We're going to spend the next several days looking at bridges that cross Weber Creek, a 12 mile long tributary of the South Fork of the American River. Forni Road crosses Weber Creek just south of State Route 50. A sign at the bridge says it was built in 1914 while the usually reliable Uglybridges Website says it was built in 1935! 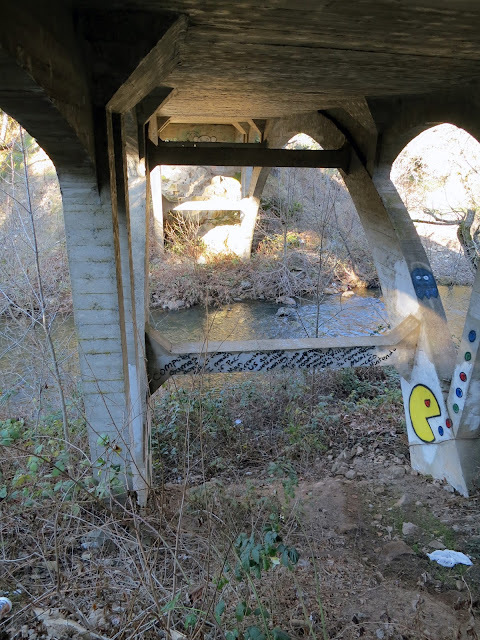 However, "Historic Bridges of California" says it is one of only two 'Turner' Mushroom Slab Bridges in California and confirms the 1914 date. CAP Turner was one of the first engineers to built a two way slab system (instead of using beams) in 1906, which eventually revolutionized the design of buildings. We'll take a closer look at this elegant bridge tomorrow. El Dorado County, California's Bridges: Forni Road Bridge across Weber Creek (1) by Mark Yashinsky is licensed under a Creative Commons Attribution-NonCommercial-ShareAlike 3.0 United States License.